Congratulations to Dr. Spaceman for getting us off to a great start! After seeing those crazy, enormous Northern Lights on day 1, he thought Destination 11 might be a planet. Excellent thinking! He must know that such aurorae are caused by the solar wind flowing across a magnetic field. 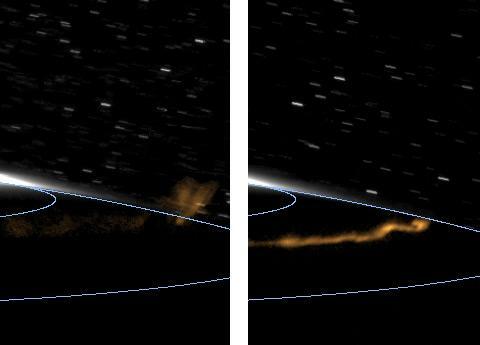 The sun provides the wind, but it takes something BIG, like say a planet, to form a magnetosphere. Then D11 himself spoke up in day 2’s limmer-iddle and revealed that he is ‘a huge gas filled ball’. So I’m sure that got a lot of you thinking GAS GIANT. But which one? (you asked yourself) After all, there are four. Then you noticed another clue in the limmer-iddle; D11 said he was ‘not the biggest’. Okay, that knocks out Jupiter. And we are down to three. From day 3‘s post you cleverly deduced that the ‘arms’ Galileo saw were really rings. You then checked and found out that, while all the gas giants have them, only one has bright reflective rings that can be seen from Earth. 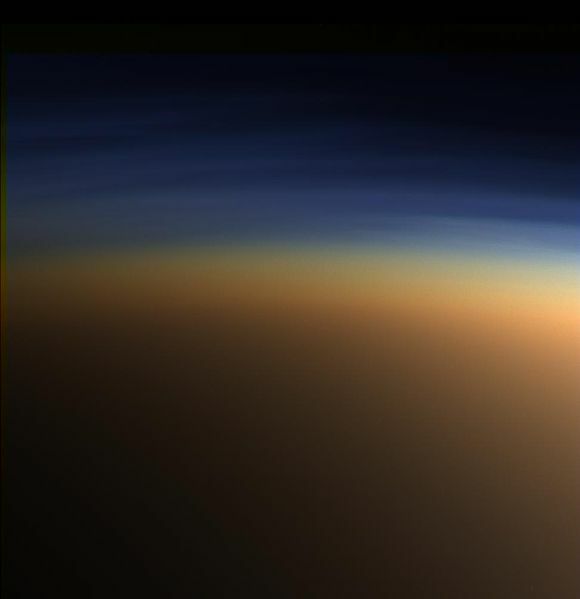 But what really cinched it for Archimedes was finding out on day 4 that one of D11’s many moons is our own Destination Ten…TITAN! 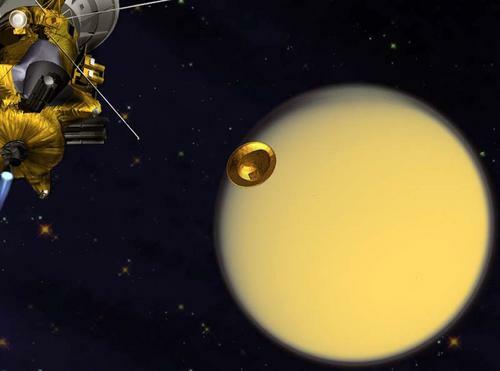 Check here and here to see what NASA‘s intrepid spaceship Cassini has learned about Saturn and its moons in the first seven years of its thirteen year expedition. Check back HERE next Tuesday for a brand new Space Game destination! It all started when these scientists started talking about this weird neutrino (very, VERY small particle) that supposedly goes faster than the speed of light (186,000 miles a second, that’s EVERY second). At first I thought, who cares, right? I mean, so this tiny thing goes really fast? What’s the big deal? 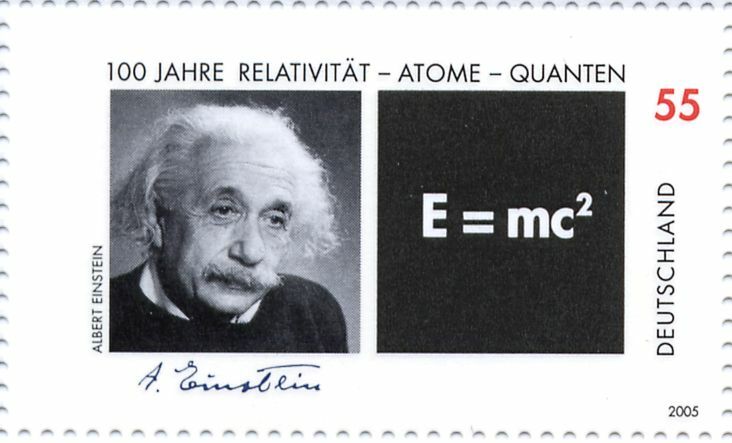 According to this theory, nothing–not a bullet, or a plane, or even a tiny neutrino–can go faster than light. If it could, well lets just say things could get bad – or cool – depending on whether or not you like the idea of . . .
Crazy, huh? I mean, if you think about it that means that you could turn a corner one day and run into a flesh eating pterodactyl taking a vacation from the Mesozoic era, or maybe a curious robot from the 27th century coming back to dissect primitive humans like us. But I wouldn’t think about that if I were you, especially not tonight when you’re out trick or treating with all those ghosties and goblins. I’m sure none of them are real live monsters from our primordial past. It’s not at all likely they could be alien zombies who invade Earth in a hundred years and then come back to get US. HEY, who is that old guy across the street with the frizzy white hair, big nose, and funny mustache??? It couldn’t possibly be….I mean, he died a long time ago…unless… Excuse me, Space Bloggers. I have a few more questions for Dr. Spaceman. But before I go, there was something I wanted to tell you… Oh, yes! For the exciting conclusion to Space Game: Where in the World is Destination Eleven? be sure to check back next week, or will that be last week? I am so confused! After reading the ‘day 3′ clue, I’m guessing that you are almost as confused as Galileo was to see that Destination Ten’s ‘moons’ suddenly disappeared, only to reappear four years later as ‘arms’. Right? Hint#1: What Galileo saw was neither ‘moons’ nor ‘arms’. For today’s post, we’ll just call them ‘things’. Now I’m going to tell you how the ‘things’ did their disappearing act. Then I bet you can tell me just what those ‘things’ really are. Ready? Here goes: When Galileo could NOT see the ‘things’, he was looking at them edge-on and they were too thin to see through his homemade telescope. When he COULD observe them, the ‘things’ were tilted at an angle and he could easily see their wide expanse through his telescope. So that means that the ‘things’ are large and wide, but very thin, sort of like a pizza. But don’t think this means that Destination Eleven doesn’t have moons. Because it does. Lots. 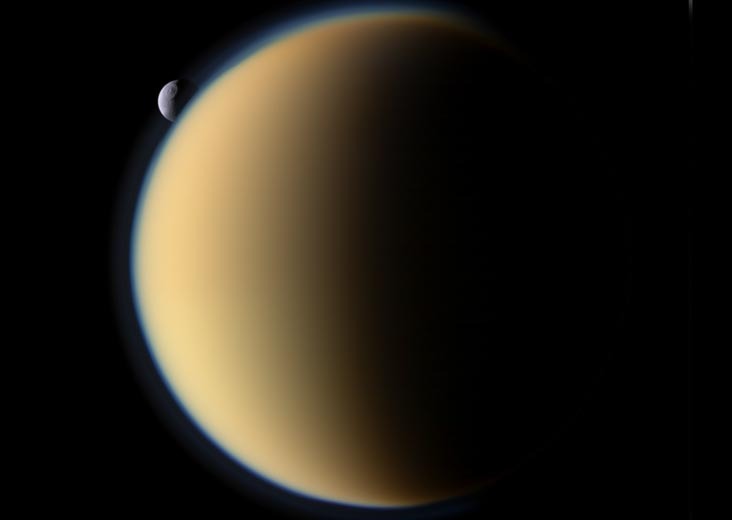 The first one, TITAN, was discovered in 1655 by Christiaan Huygens, a Dutch astronomer. 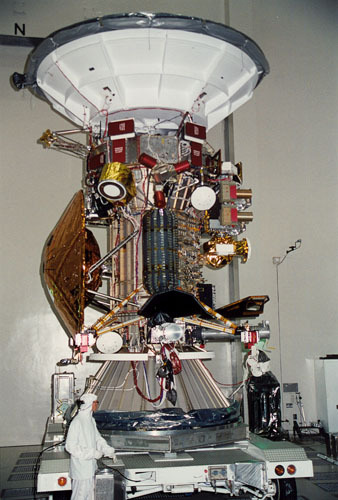 Just a few years later an astronomer named Cassini discovered four more moons, IAPETUS, RHEA, TETHYS, AND DIONE. Since then, 13 more have been discovered bringing the number of moons orbiting Destination Eleven to a grand total of 18. So long for now, Space Bloggers. But be sure to check back next week when I announce the answer to that burning question: Where in the world is Destination Eleven? That is, unless YOU write in with answer first! A star exploded in the Pinwheel galaxy 21 million years ago!!! Fast breaking? (you ask) That’s right! (I answer) Even thought the star exploded 21 million years ago, it did so in a galaxy so far, far away that light from the explosion is just now reaching Earth. And it won’t be around for long. 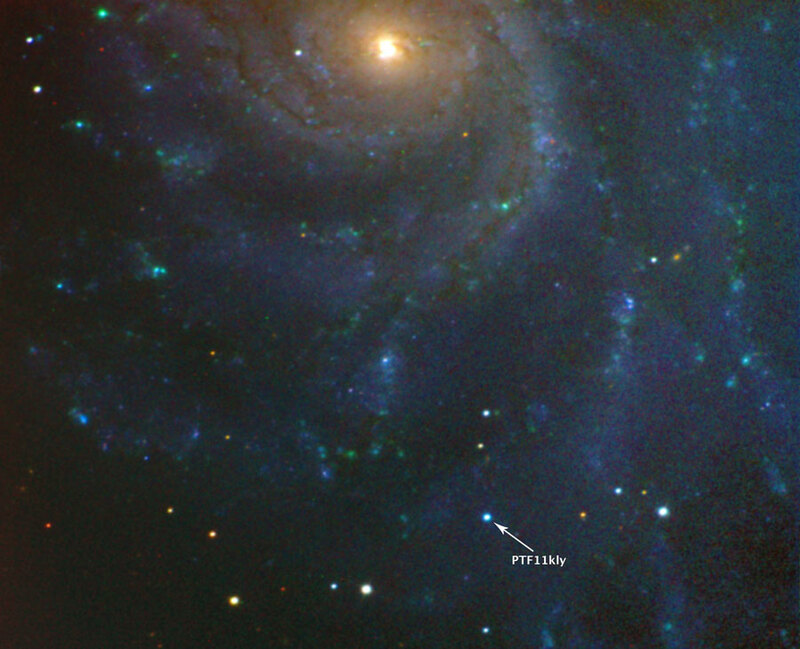 Light rays from the supernova first hit Earth a couple of weeks ago, Tuesday, August 24th. The explosion was noticed within hours by crack scientists at the Palomar Observatory. It has been getting brighter each night and will reach its peak September 9 and 10, 2011. You can see the real thing – an exploding star – every night this week with a good pair of binoculars. Happy star watching, Space Bloggers! 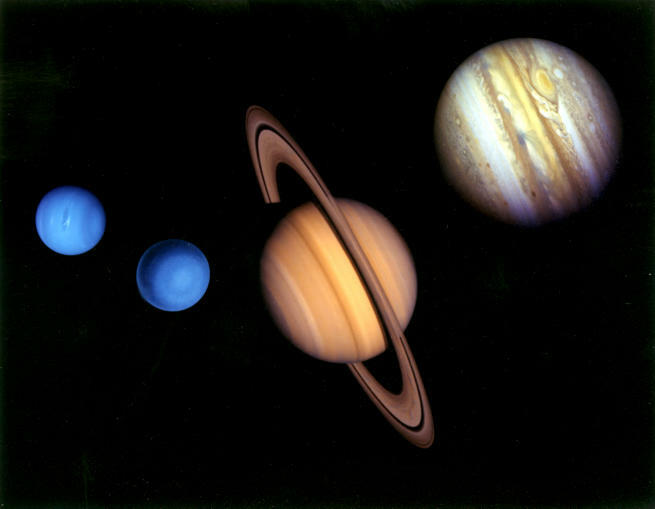 See you next week with the 3rd installment of Space Game: Where in the Solar System is Destination Ten?